Researching the implications of downsizing the human species to better fit the earth. A tree in nature and growing under perfect conditions, will grow until it reaches the predetermined height and width for that species within the given environmental circumstances. Upon reaching full potential the now massive amount of foliage at the incalculable number of branch tips is just too vast. The tree starts to weaken and eventually dies because the foliage has grown too far away from the active roots. 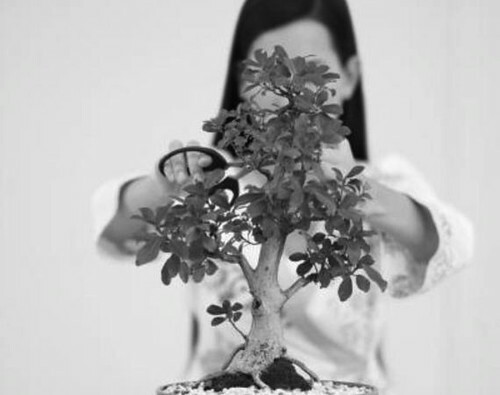 Conversely a bonsai tree, which is prevented from ever reaching its maximum dimensions through regularly pruning of the roots and and branches, could theoretically live forever. The careful and calculated care management keeps the bonsai in a constant state of growth, because the bonsai, just like its full-size cousin, is genetically programmed to achieve maturity. The essential difference is: by preventing the bonsai from reaching maturity, you are preventing it from ever reaching old age and falling victim to the troubles that inevitably go along with the aging process. Within Japanese philosophy there’s a notion that to cultivate a bonsai tree is in fact to cultivate yourself. The bonsai represents man. Therefor it is of some interest to The Incredible Shrinking Man to investigate if, and how, this cultivation of a smaller self relates to the idea of shrinking the human body, as well as nurturing the desire to do so. Perhaps the aesthetic pleasure exprienced in bonsai can be extended to experiencing aesthetic pleasure from shorter human beings. To some this might seem like a stretch; why would miniaturising a tree have anything to do with a desire to shrink the human body? Perhaps nothing, yet on an abstract level there’s an interest in the inter-relatedness of these deeply rooted notions of survival as well as its connection to the idea of becoming immortal. If we continue to grow as we do at present, at some point survival is indeed what is at stake. Perhaps we should remain in a permanent state of physical immaturity, never quite reaching our full potential, and at the same time, paradoxically, allowing ourselves to continue to grow forever. The Incredible Shrinking Man is a speculative design research about the consequences of downsizing the human species to 50 centimeters. It has been a long established trend for people to grow taller. As a direct result we need more energy, more food and more space. But what if we decided to turn this trend around? What if we use our knowledge to shrink mankind? © 2008, 2009, 2010, 2011, 2012, 2013 Created by Arne Hendriks. All rights reserved. RSS feed.